Their home was destroyed by wildfires, but rescuers gave them hope. Much has been written about the plight of orangutans clinging to life in the dwindling forests of Indonesia. But where words fail, a single image can say so much. 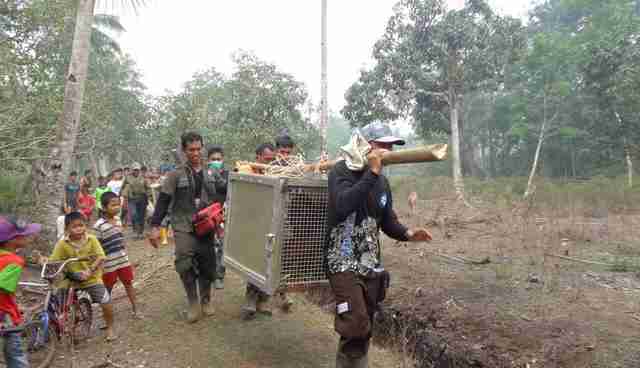 Volunteers from International Animal Rescue (IAR) were working on the ground in Borneo to save the lives of animals affected by a massive wildfire ravaging the island's forests when the group came to the rescue of a desperate orangutan and her baby - victims not only of the blaze, but of human cruelty as well. "They were forced out of their forest home as a result of the fires and ended up in a village. The villagers were frightened and threw things at the terrified mother before attempting to capture and tie her up," IAR wrote in a post online. "Fortunately our team got to her just in time." A photograph of the scene shows that rescue in heart-wrenching detail: the anguished mother's look of relief to feel the touch of a gentle hand, as if she suddenly knew she and the infant at her breast were going to be OK.
"They quickly anaesthetised the mother with her frightened baby clinging on tightly," wrote IAR. "They have now been translocated and released into a safe area of protected rainforest and are being monitored by a conservation team to ensure that they are recovering well from their terrible ordeal." More than a dozen orangutans needed rescue due to the fire, likely set by ranchers to clear land for farming, which has scorched many acres of the protected forest that remain for these critically endangered primates. This mother and baby are certainly among the lucky ones to have escaped with their lives. "We don't know how many orangutans we have lost in this crisis but we know that this is going to be devastating for orangutan populations in the wild and could mean that orangutans will soon be closer to extinction," says Karmele Llano Sanchez, Program Director for IAR Indonesia, in a release. "This is a global environmental crisis and it is already considered by experts as the worst manmade ecological disaster of the century which will affect the lives of people the world over. I fear that in terms of the orangutans, the worst is yet to come." Thankfully, amid so much devastation, there are people working every day to make sure all hope is not lost. 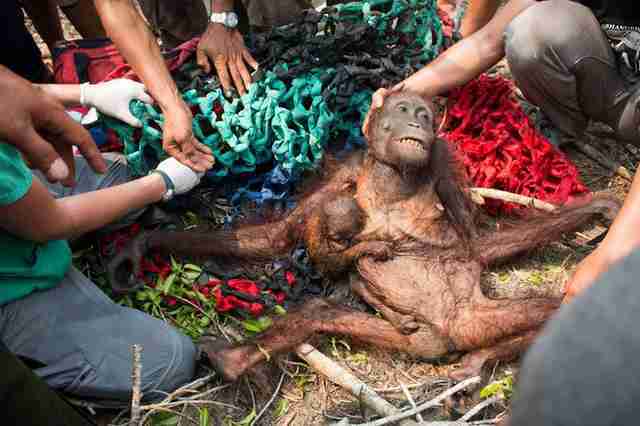 To help rescue more orangutans in need, you can donate to International Animal Rescue.